Managing customers profitably is the core objective of a company. How to manage customers? this is the question that get asked very frequently. For this question, many researchers and managers try to dig out the solution. There are a number of CRM models have developed to learn how to manage customers. CRM models are helpful to understand the concept of CRM and regulate the modern concept of CRM. The IDIC model was developed by Peppers and Rogers. This model suggests that companies should take four actions in order to the building, keeping and retaining the long-term one-to-one relationships with customers. First, a company must identify who is an actual customer and should know about deep knowledge of their customers. 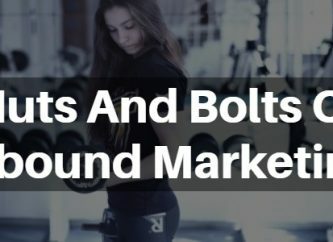 It is not only necessary to know about your customers but you have to know about more and more your customers so that you can easily understand them and serve them profitably. Value: Differentiate your customer to identify which customer is generating most value now and which offer most for the future. Give more value to those customers who are generating more value for you. Need: Differentiate your customers according to their needs. Different customers have different need and serving the in profitable ways need more knowledge about their needs. 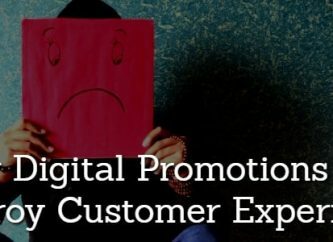 The company must emphasis on interaction with the customer to ensure that you understand customer’s expectations and their relationship with a brand. The company must consider Interaction with customers according to their needs and value that they are providing you. Interaction directly with customers makes believe that company has a concern with them and company wants to serve them individually. 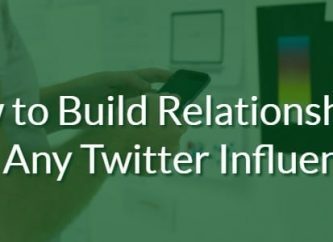 These efforts make customers loyal and help the company to build long-term relationships. When you differentiate your customers according to their values and needs, after that, you have to customize your product according to their needs and values. Customize the offer and communications to ensure that the expectations of customers are met. Interact to customize is information to customers about your ability to cope with their need. Failure in the third step means something wrong with second or third steps. So return or go back to previous steps study them again and search out more and more and rearrange these steps. The QCI model is also a product of a consultancy firm. The model’s authors prefer to describe their model as a customer management model, omitting the word ‘relationship’. At the heart of the model, they depict a series of activities that companies need to perform in order to acquire and retain customers. The model features people performing processes and using technology to assist in those activities. This model includes the series of activities related to employees, people, and organization, and technology as well. According to this model, relationships process with the external environment. Because when a customer wants to start selling process or wants to interact with the organization, external environment directly affects the customer experience. External environment also affects the planning process of the organizations. 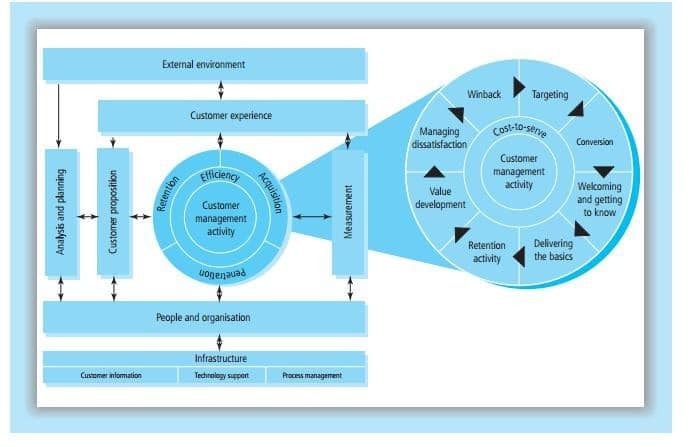 Now as you can see in the figure that customer experience affects three activities future: customer proposition, customer management activity, and measurement. Customer proposition means something that a company offers to the customer against the price. Customer management activity is a process of capturing customers, start with targeting, conversation, selling and end with retaining or winning back the customers. Customer management activity affects customer’s experience that how a company acquires, retains a customer and also penetrates. Finally, measurement process also affects the customer experience. People and organization have relation with the planning process, customer proposition, customer management activity and measurement. Because CRM starts with people and ends with people. Infrastructure deals with the organization in a sense of technology, customer information, and process management. One big thing is that each activity, people, organization, process, and technology have a dual effect and intercorrelated with each other. CRM, the meaning of those three letters, is emotionally contested. For some, CRM is simply a bridge between marketing and IT: CRM is, therefore, an IT-enabled sales and service function. For others, it’s little more than precisely targeted 1- to-1 communications. Simply we can say, CRM Is a tool to manage customer relationships with the help of people, information technology, customer’s data, company’s process and customers themselves. The CRM value chain is an established model which businesses can easily follow when they developing and implementing their CRM strategies. It has been five years in development and has been piloted in a number of business-to-business and business-to-consumer settings, with both large companies and SMEs: IT, software, telecoms, financial services, retail, media, manufacturing, and construction. The model is based on strong theoretical principles and the practical requirements of business. The ultimate purpose of the CRM value chain process is to ensure that the company builds long-term mutually-valued relationships with its strategically significant customers. Not all customers are strategically significant. Indeed some customers are simply too expensive to acquire and service. They buy little and infrequently; they pay late or default; they make extraordinary demands on customer service and sales resources; they demand expensive, short-run, customized output; and then they defect to competitors. These are called strategically-insignificant customers. The five steps in the CRM value chain are customer portfolio analysis, customer intimacy, network development, value proposition development and managing the relationship. 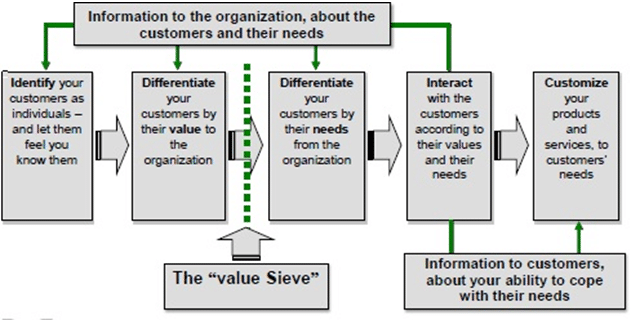 CPA, the first step in the CRM value chain acknowledges that not all customers have equal value to the company. SSC’s is defined thoroughly above so let’s move toward CPA. CPA tells us what are our customers giving value to us? A customer portfolio comprises the mixture of groups that make up the customer base of a business. For example, Coca-Cola’s customer portfolio consists of restaurants, grocery stores, amusement parks and sports arenas. It means before starting the CRM process, an organization should know about their customers thoroughly. Selecting customers to serve with your product is one thing and knowing your customer is another thing. Most companies collect customer data. Some industries are overwhelmed with information – scanner data, loyalty card data, complaints files, market research, and geo-demographic data. Now the question is how you will use this data in order to serve best ways to your customers. Long-term relationships require more knowledge about you customers. Knowing about what, who, why, when and how of customer behavior is most important for a company to manage long-term relationships with loyal and strategically insignificant customers. A company’s network position i.e. its connectedness to other parties who co-operate in delivering value to the chosen customer is a source of great competitive advantage. In order to serve customer’s relationships, it is important for a company to create value for a customer on every stage of the selling process. It means the company must create a complete network for customers to serve profitably. A good network may contain suppliers, manufacturers, employees, investors, technology, distributors, and retailers. CRM is not a quick fix; it requires owners and investors who will commit to the long-term investment in the people, processes, and technology to implement CRM strategies. By the fourth step of the CRM value chain, you will know who you want to serve and will have built, or be in the process of building, the network. Now the network has to work together to create and deliver the chosen value(s) to the selected customers. Network develop by the company now will create a value proposition. Every member in a developed network works together as a whole to creating value for customers. This is the final step of primary stages. All previous steps help the company to create the relationship and start the relationship. Now, this depends on company how a company manages these relationships so that parties, company, and customer, get value for the long term. 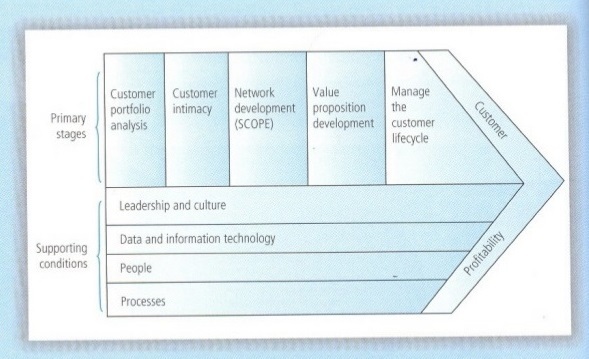 These are five supporting conditions to fulfill the CRM value chain model. 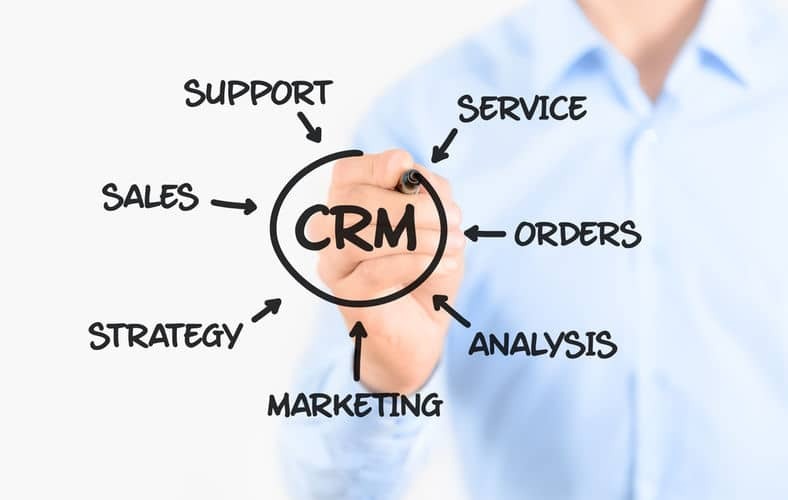 These are some basic conditions that a company even must consider while managing the CRM. Company’s culture defines that whether you will manage long term relationship or not because sometimes your culture doesn’t allow you to do such activities. Company procurement process and HR process also suggest that how you will do such activity. Without IT and Data management process you cannot do CRM because customer’s information and data related to customers save on technology. Organization design helps to manage the relationships. Got any questions? Or maybe, have something to add? Please leave a comment below and tell us what you’re thinking.